I ordered this shirt in a 5/6 and a 7. These are good quality and cute, but run really small. The 5/6 fits my small (36lb, 42in tall) 5yo at the moment, but with no room to grow into it. It will not last long for us. Well made and very comfortable shirt for casual wear. Looks great after several washings. Our son likes the softness of the material. The color matches well with many of our 13 year old`s other clothess. 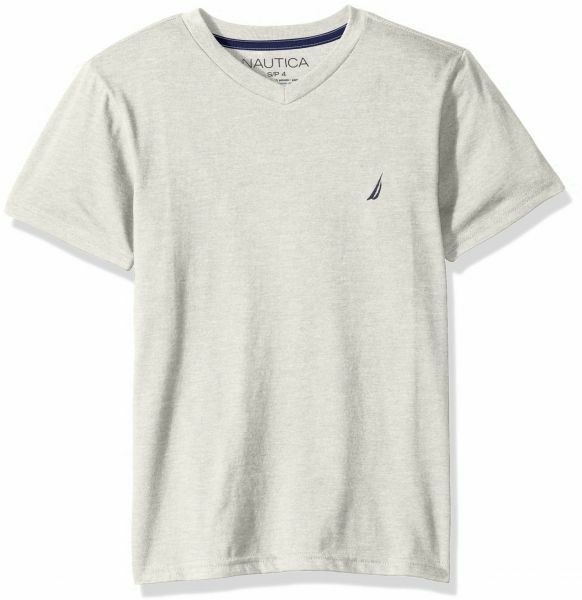 The Nautica brand is a favorite of ours as it blends quality with a bit of exclusivity at a reasonable price. These shirts are well constructed, soft material, and the color is exactly as pictured. I knocked off a star because they run small. Order a size up. This is a great neutral color that would go with many shades of denim bottoms. Our boys are wearing these for our family photo and I like that it's a great alternative color to plaid, stripes and blue.